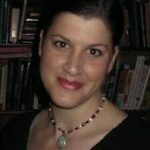 This week our waking hours are consumed with thoughts of Thanksgiving—the menu, the shopping and most of all setting the table. 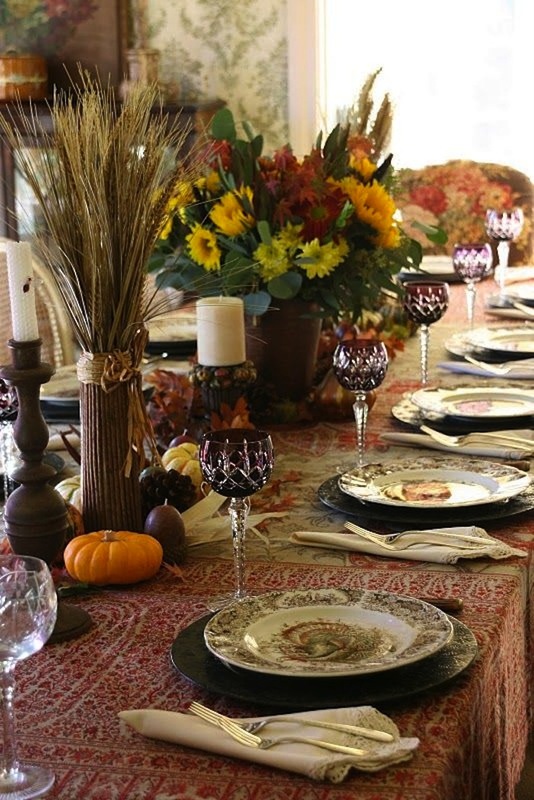 Centerpiece, china, flatware and crystal and how to pull it all together, that what we’re thinking about. 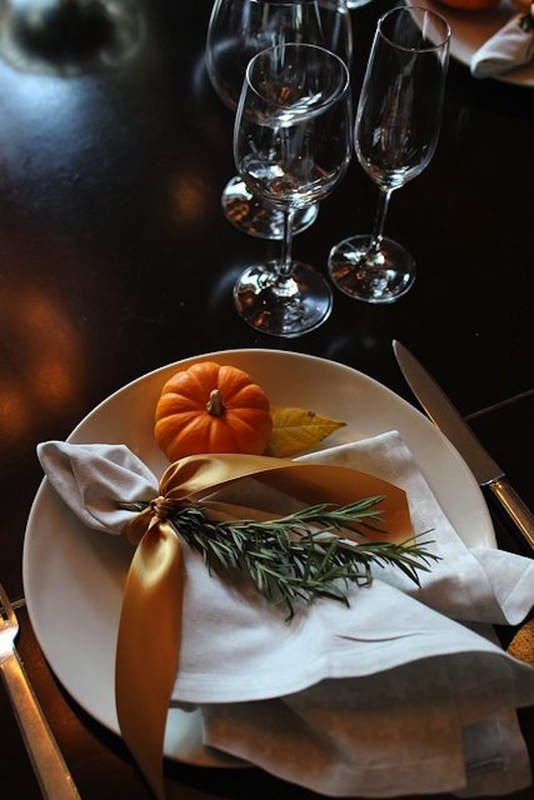 Today, we are so happy to share just a few of the many recently discovered ideas for Thanksgiving table settings, food service and a special treat for you at the end of this holiday post. 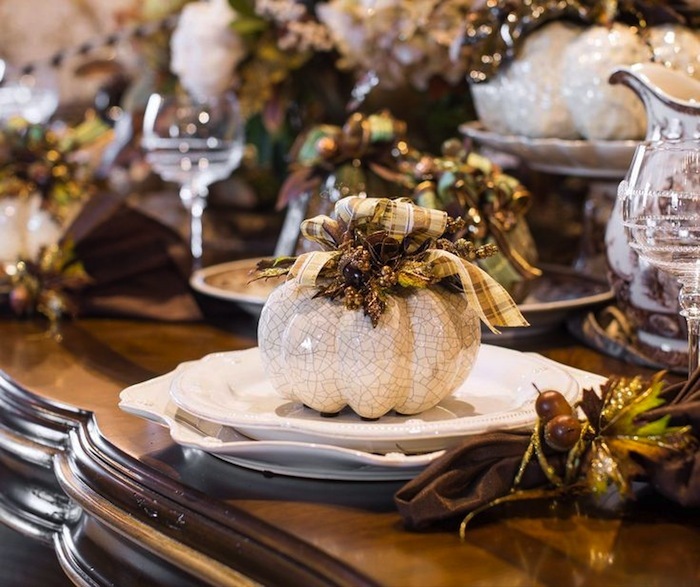 For a large gathering of friends and family, nothing says Thanksgiving like a long table set with a traditional mixture of china and pumpkins galore. From the lovely neutral color palette in the first image above, let’s turn to the brilliant hues of these pumpkins, gourds, chrysanthemums and fall leaves. Aren’t they gorgeous? Need a volunteer to sit at the kids’ table? Count us in because that’s where all the fun happens. 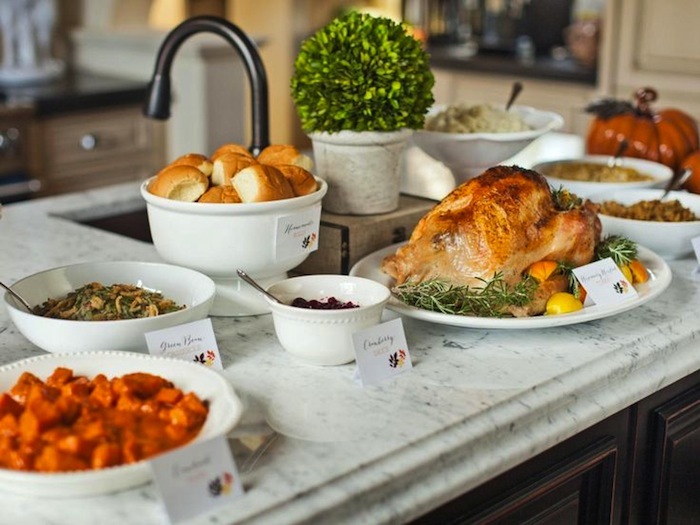 The thoughtful host of this Thanksgiving meal has created an interesting and interactive table for the little ones. 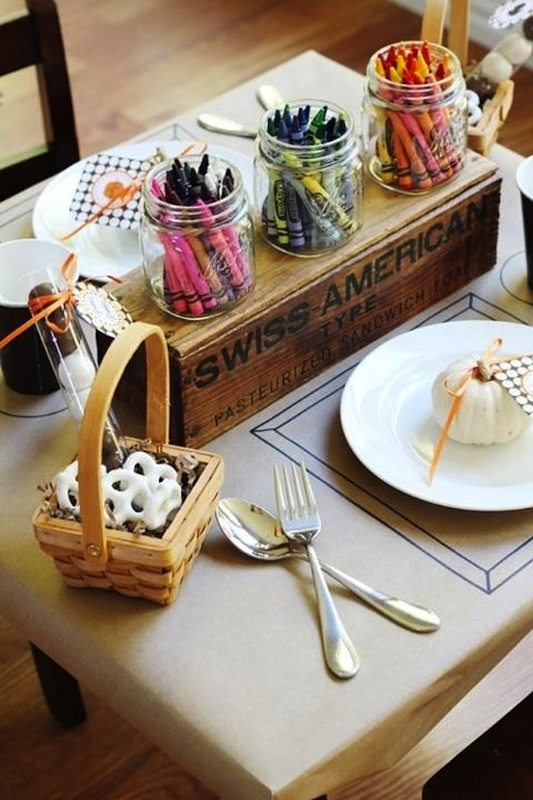 A personal goody basket for each child and crayons to decorate the paper table covering are just right to keep everyone happy and engaged. If the weather is suitable, open the doors and enjoy the fresh air and autumn colors. 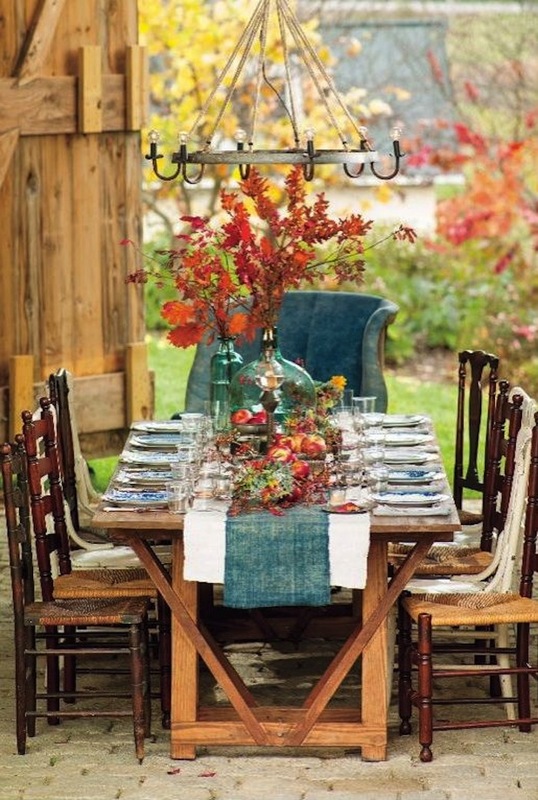 Mismatched chairs and a colorful tablescape are perfect for this natural setting. We love velvets in any and all forms. 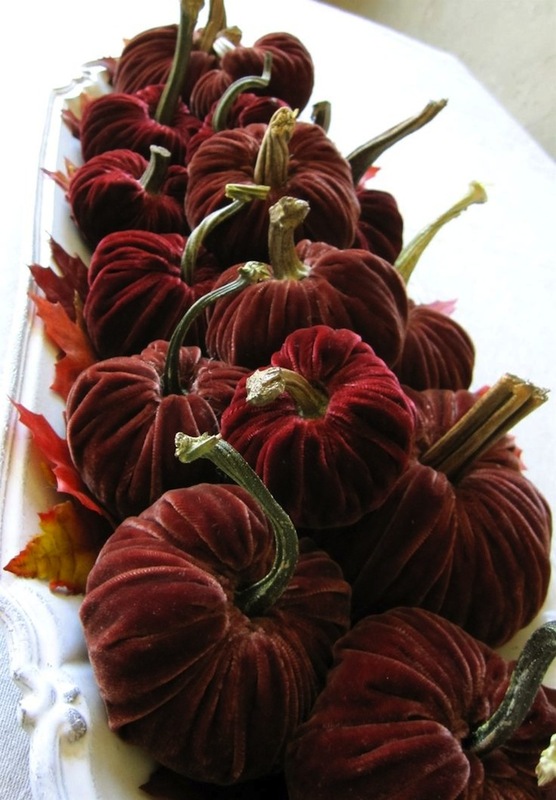 These appealing velvet beauties are no exception. 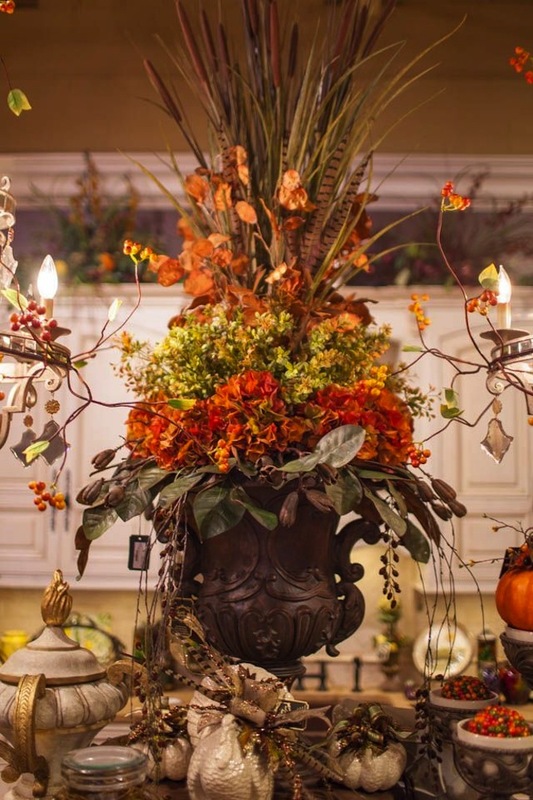 Wouldn’t this lovely collection be stunning as a Thanksgiving centerpiece? 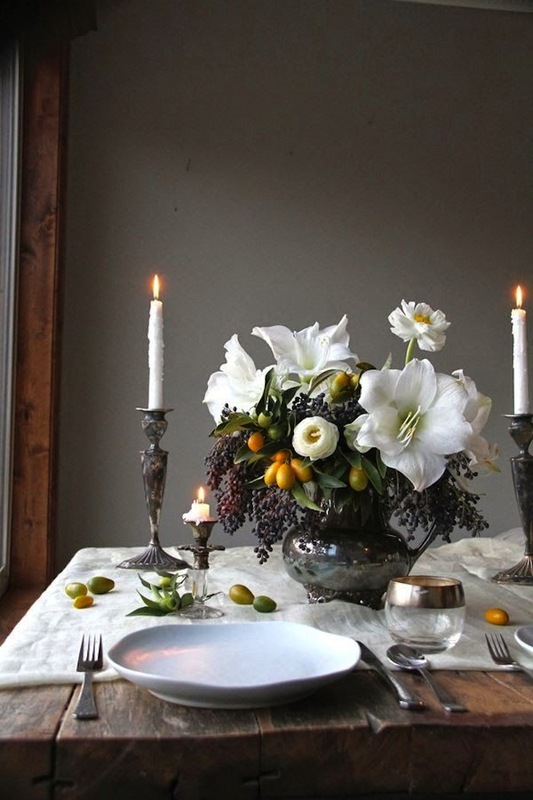 A timeless table setting with candles, fresh flowers and kumquats is at once elegant and rustic. We’ve fallen for this lovely table. 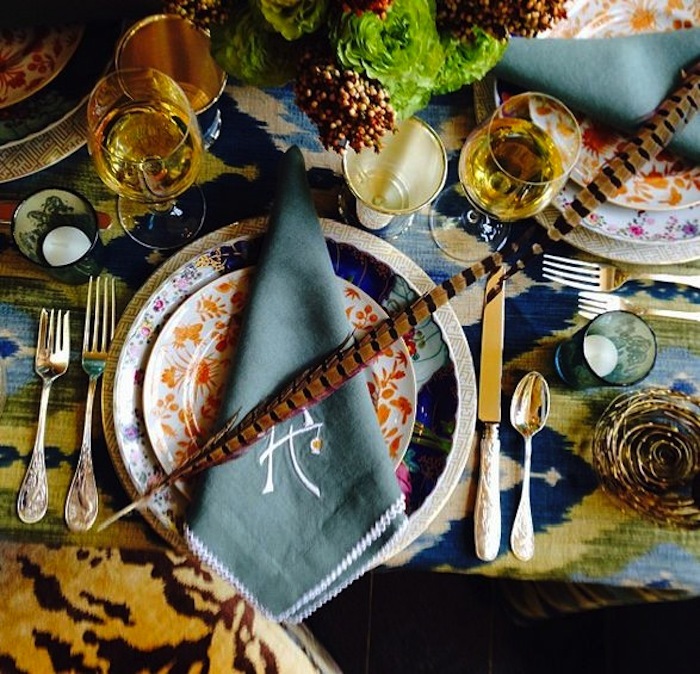 This Thanksgiving table is filled with slightly exotic color and pattern. In this case, more is definitely more, don’t you thinks. 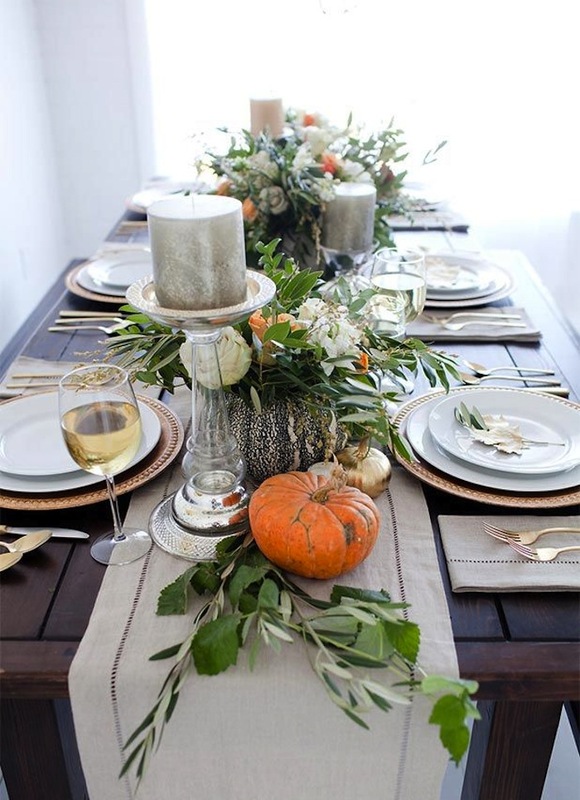 If chic modern is your style, here’s a crisp and clean white table setting to inspire. 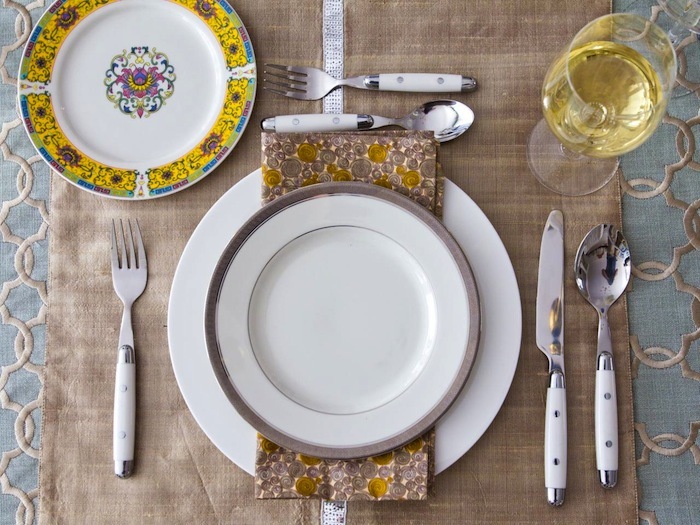 Isn’t the flatware simple perfect with these china patterns? 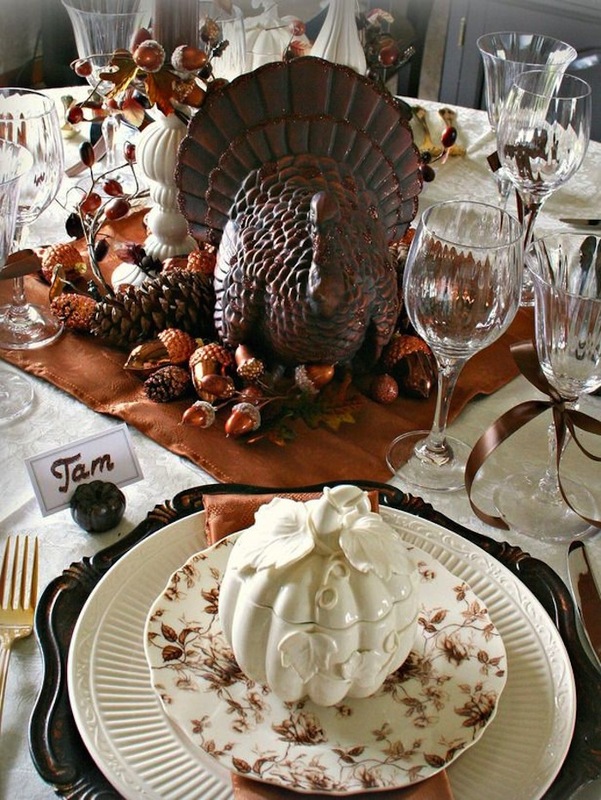 Bring out that traditional centerpiece complete with ceramic gobbler and all those leaf covered individual serving pieces and have your self a very happy retro Thanksgiving. 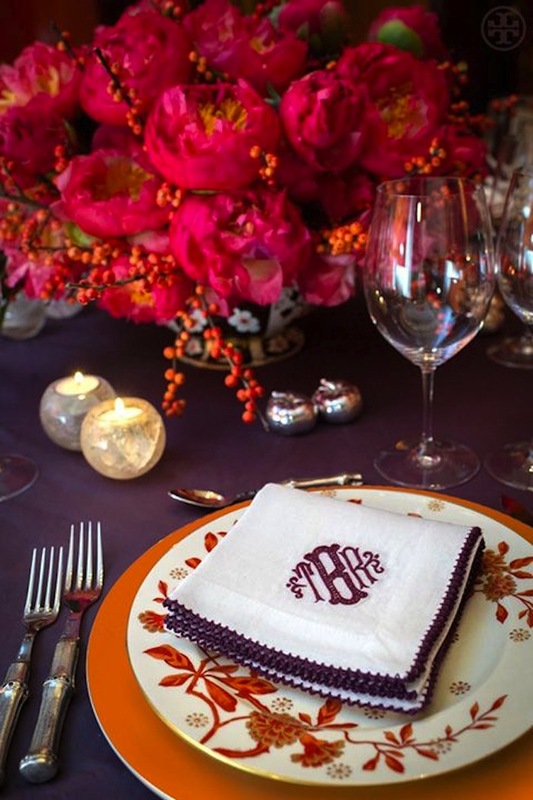 We love the coppery hues used here. 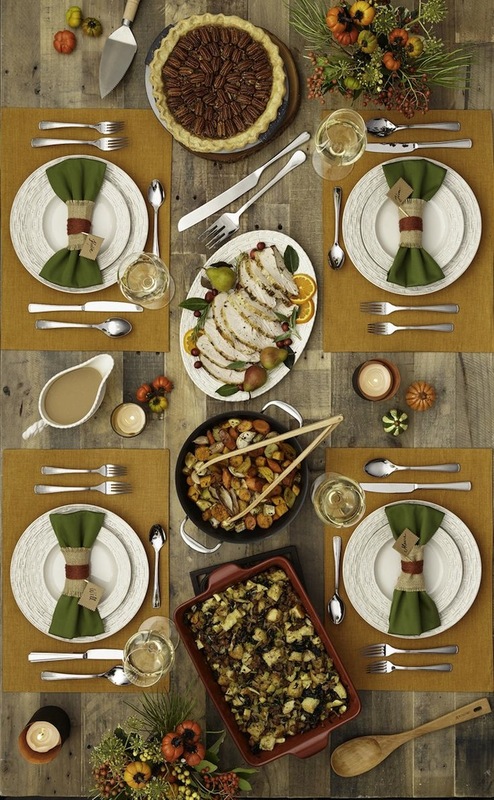 With all those table settings and decorations you might find you have no room for the food on your holiday table. No worries. Set up a buffet on the kitchen island. This clever hostess added menu cards that tell the name of each dish and who created it. How fun is that? 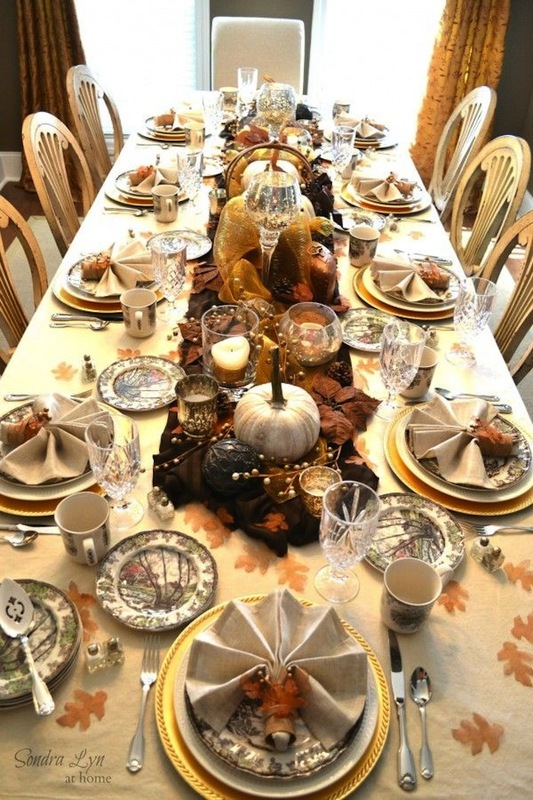 This beautiful and inviting Thanksgiving table included dishes served family style. The food just fits single file down the center of the table. 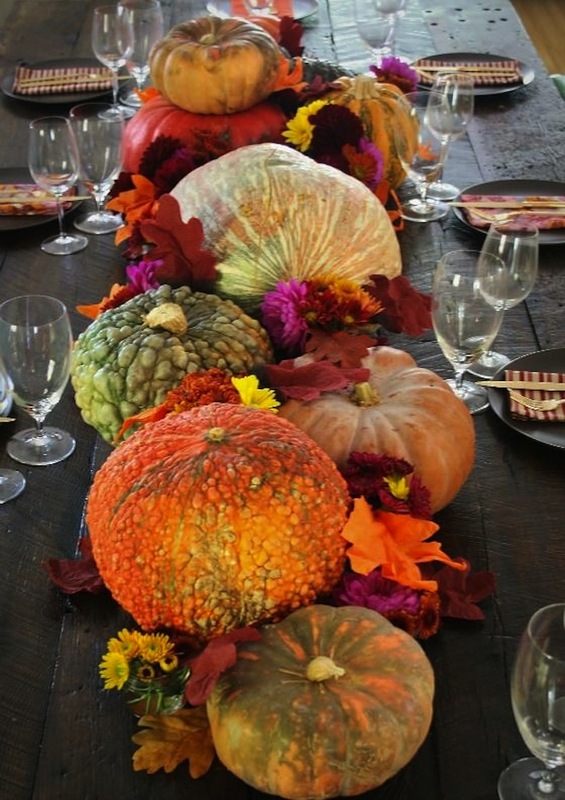 Food as tablescape—now that’s an appealing edible idea! Another clever idea using food is this simple modern table with fresh vegetables as decoration. 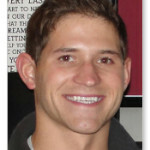 This one is easy on the host and filled with natural good looks. 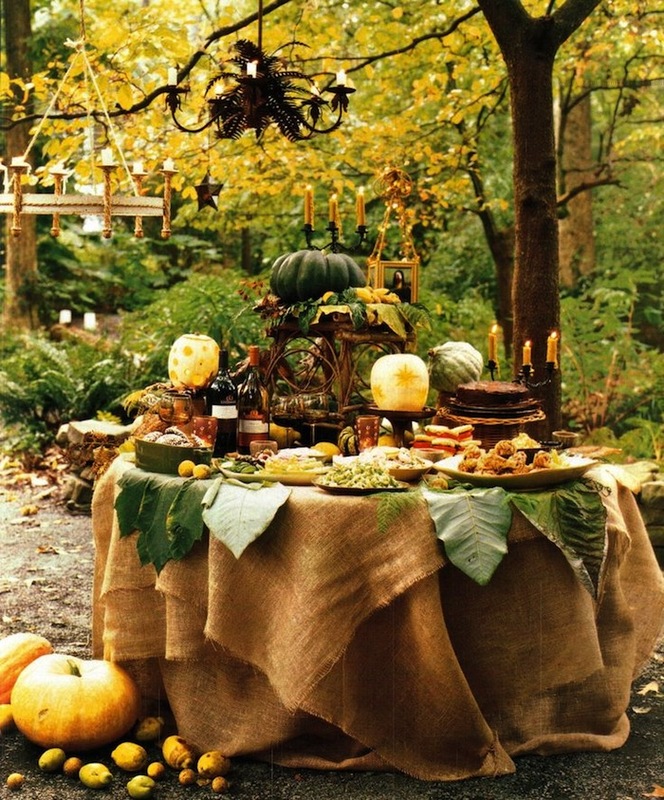 Like a Thanksgiving fairy table, this rustic outdoor holiday setting is fit for any Prince Charming and his princess. 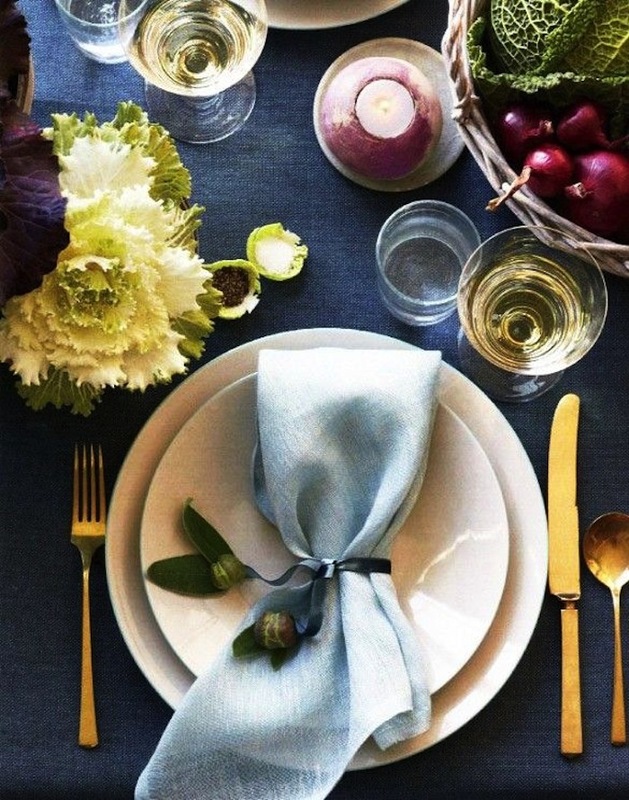 From the burlap table coverings to the mismatched hanging lights, this is Thanksgiving perfection. Here’s that special treat we promised. 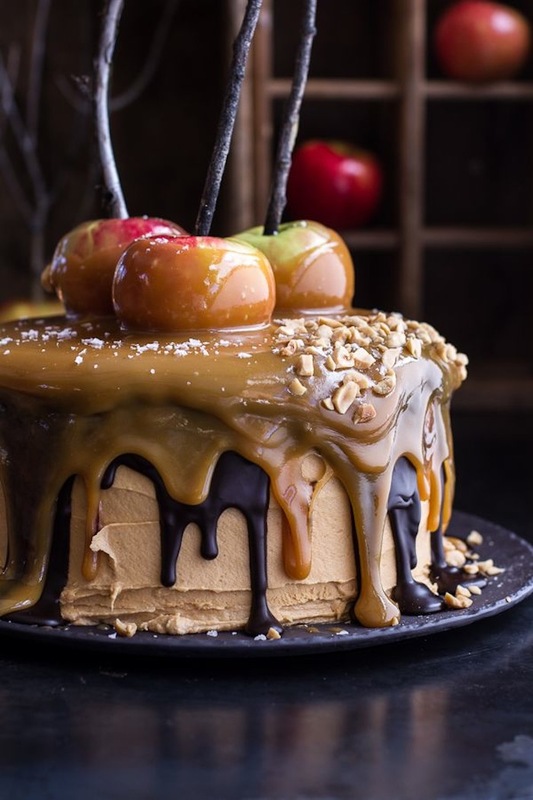 Could any holiday dessert be more stunning than this Salted Caramel Apple Snickers Cake? You will find the recipe for this beauty over at Half Baked Harvest. Image Sources: Pinterest.com; ThePerfectPalette.com; ToryBurch.com; DomaineHome.com; HGTV.com; VignetteDesign.net; LinlyDesigns.com; ModVintageStyle.blogspot.com; HouseBeautiful.com; SondraLynAtHome.com; ProjectNursery.com; TheGlamorousHousewife.com; GreigeDesign.com.